Rooms at the Value Travel Inn located near the interstate restaurants and shopping are equipped with free Wi-Fi mini-fridges and microwaves. The two-story Value Travel Inn offers 60 rooms with free Wi-Fi mini-fridges and microwaves. The hotel's continental breakfast includes all the free coffee you need. Take advantage of the hotel's grills for an evening picnic. There is also an on-site guest laundry. Pets are permitted for a fee. Parking is free. Non-smoking rooms may be requested. 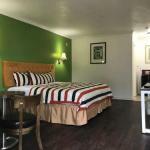 The hotel is located at the intersection of I-10 and Highway 190 a half-hour from all the action in New Orleans and its famous French Quarter. Ochsner Medical Center is a half-mile away. The Slidell Amtrak Station is three miles from the hotel. Stennis International Airport is 18 miles away and Louis Armstrong New Orleans International Airport is 37 miles from the hotel.